Ahh, can you smell the pumpkin spice lattes in the air? Can you hear the crunch of the fallen leaves beneath the feet of the weeping angels which surround you as you blink at an inopportune moment? Can you see those spooky… wait no, no, what are we talking about? I don’t remember seeing anything, do you? Where did these tally marks come from? …Anyway, it’s autumn, and we here at 3 Chic Geeks are absolutely psyched for autumn. I’m sure, dear readers, that you agree with us – what with the pumpkin spice lattes, Halloween, Supernatural on TV, orange things, plaid flannel, cozy layers, hot tea, NYCC, warm jumpers and caramel apple Milky Ways – autumn is clearly the superior season. Of course, along with all those other wonderful things, autumn brings a veritable oncoming storm of fall fashion options. We here at 3 Chic Geeks are always pondering the contents of our closets, and today seemed like a good day to spill the contents of our wardrobes on the floor and play in our stockpiled attire until we end up with Doctor Who inspired outfits. So, um, yeah. Here you go. Categories: Doctor Who, Fashion | Tags: amy pond, autumn, doctor who, Fall, fashion, idris, Rose Tyler, shopping, TARDIS, time travel | Permalink. We started out with thirty two fandoms, and cut them down brutally in swaths, until only two British behemoths stood, facing off against one another. The voting has been intense… who will win? 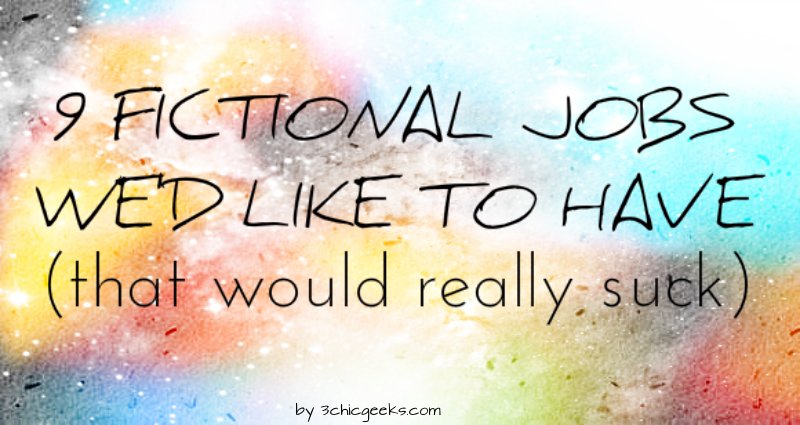 Will it be Harry Potter, the stuff childhoods are made of? Will it be Doctor Who, the stuff time and confusion is made of? Well… you’ll find out under the cut. Categories: Doctor Who, Fandom Life, Harry Potter | Tags: doctor who, fandom, fandom deathmatch, fandom wars, harry potter, poll, results | Permalink. Categories: Doctor Who, Harry Potter | Tags: doctor who, fandom wars, harry potter, oops, the final round, there will be pain, this is the end, this isn't tumblr, whatever | Permalink. As you’ve probably heard by now, Matt Smith will be leaving Doctor Who following the Christmas special. Considering this rumor has been going around for some time now, we can’t say that we’re terribly surprised. While we’ll be sad to see Matt go, this announcement has sparked endless amusing debate over who should play the next doctor. At this point the name of nearly every living British actor (and some Americans) has been proposed to take up the helm of the iconic character. Not wanting to miss out on the lively debat, we thought we’d provide you with a rundown of our favorite choices. Categories: Doctor Who | Tags: 12th doctor, andrew scott, anna chancellor, ben whishaw, benedict cumberbatch, chiwetel ejiofor, doctor who, films, george harris, harry potter, hitchhiker's guide to the galaxy, hugh laurie, idris elba, james frain, kingsley shacklebolt, matt smith, midnight in paris, misha collins, natalie dormer, russell tovey, the hour, tom hiddleston, twelve, underworld, whoverse | Permalink. I wear a bow tie now, bow ties are cool. 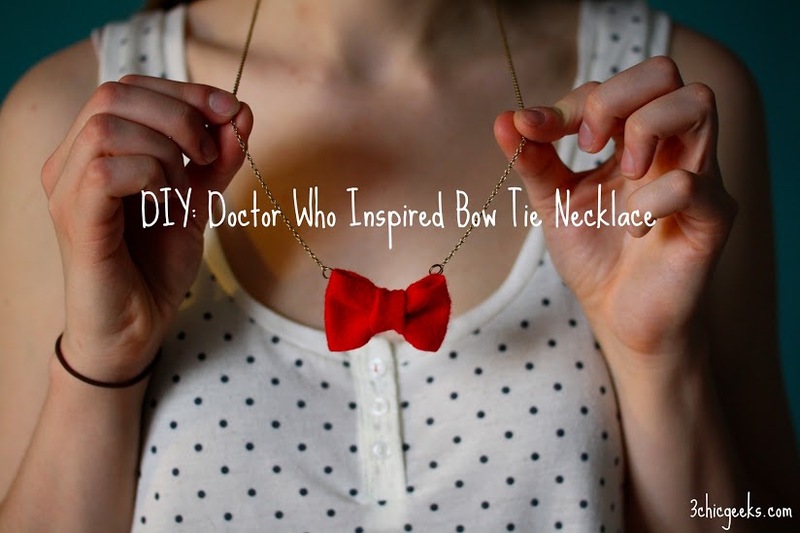 I spent a lot of time staring at the adorable bow necklace in our Nerdy Fashion: Doctor Who Edition post. So much time that I talked myself out of buying it and into making it. It’s so easy and so cheap that I decided to make a tutorial. For about $6 and a half hour of my time I made a pile of bows, a hair clip, a necklace, and two bow tie pins that would be great for a last minute Eleven Costume. If you can’t sew, don’t worry, I can’t really sew either. If you can kind of make a straight line, you can make a bow. If you’re really sewing phobic you can do all of this with fabric glue or hot glue. (Had I a hot glue gun, best believe I would have used that.) You can do this with just about any fabric you have lying around; I used some red felt. If your fabric is on the thicker side, (like felt, leather, denim, corduroy etc…) follow these directions. 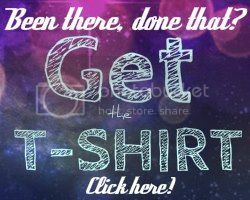 If your fabric is on the thinner side (maybe you’ve found an old t-shirt you’d like to cut up), you can follow the directions in this post on Lula Louise. Categories: DIY, Doctor Who | Tags: bow, Bow Necklace, Bow Pin, bow ties, Bow Ties are Cool, DIY necklace, doctor who, easy sewing project, Eleven, fabric bow, felt bow, Hair bow, matt smith, Pins, Red Bow, scrap fabric, the doctor | Permalink. Are you one of those people who has the urge to wear your favorite Who tee every day? Have you amassed a collection of Megan Lara shirts commemorating all your favorite companions? Do you get new Doctor Who apparel from all your friends every holiday? Do you really love nerdy fashion? If you’ve answered yes to any of these questions, this post is for you. Categories: Doctor Who, Fashion | Tags: bow ties, clothing, doctor who, fashion, geek, nerd, nerdy, Rose Tyler, TARDIS | Permalink. 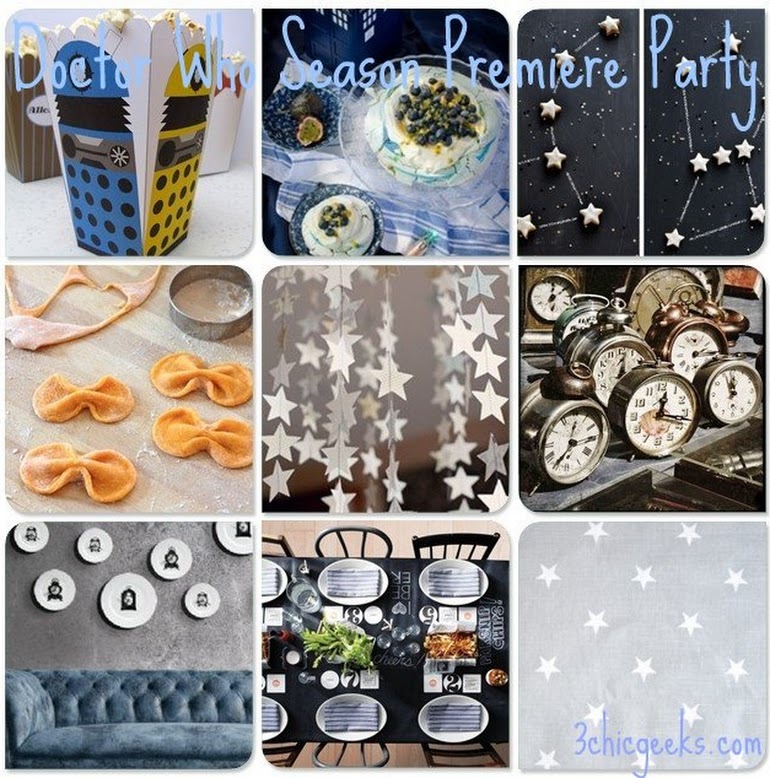 This Easter Eve/Passover, why not take advantage of the large crowd probably gathered at your house or your relatives house and force them to attend throw a fantastic Doctor Who Season Premiere Party as part of the festivities already underway. Now, we’re not just talking about baking up some fish fingers and buying some star confetti to throw on a blue plastic tablecloth. We’re about to throw the classiest Doctor Who party this side of the red carpet premiere. Brace yourselves. Categories: Doctor Who | Tags: diy, DIY Fez, doctor who, Doctor Who Season 8, fish fingers, food, Pavlova, Popcorn box | Permalink. Back by popular demand and now featuring even worse potential fictional boyfriends. Many of the men listed were specifically requested by you, the readers. The others are here because we do what we want feel they are definitely worth a mention. Think twice before making one of these fictional hotties your beau this Valentine’s season. 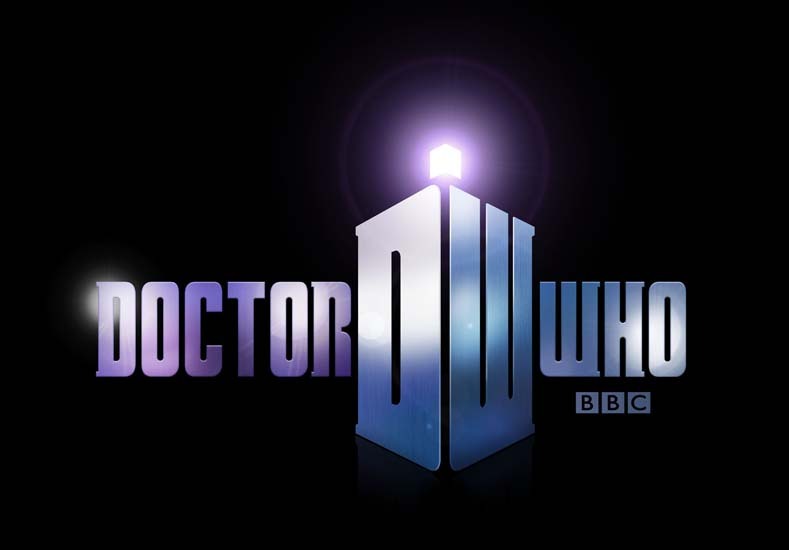 Categories: BBC Sherlock, Doctor Who, General Nerdiness, Supernatural, TV | Tags: a song of ice and fire, angel, bbc sherlock, boyfriends, buffy, buffy the vampire slayer, castiel, dating, doctor who, eharmony, firefly, game of thrones, jim moriarty, jon snow, mal, malcolm reynolds, Moriarty, phantom of the opera, sherlock, sherlock holmes, spike, stark, supernatural, the doctor, The Master, the phantom | Permalink.